The vast majority of human action reflects the thoughts, beliefs, and feelings of the actor. There have always been and there will always be those whose actions are erratic or divorced from reality. The actions of this small minority are best ascribed to pathology not philosophy. For the rest of us, we think therefore we are. What we think about today we act upon tomorrow. 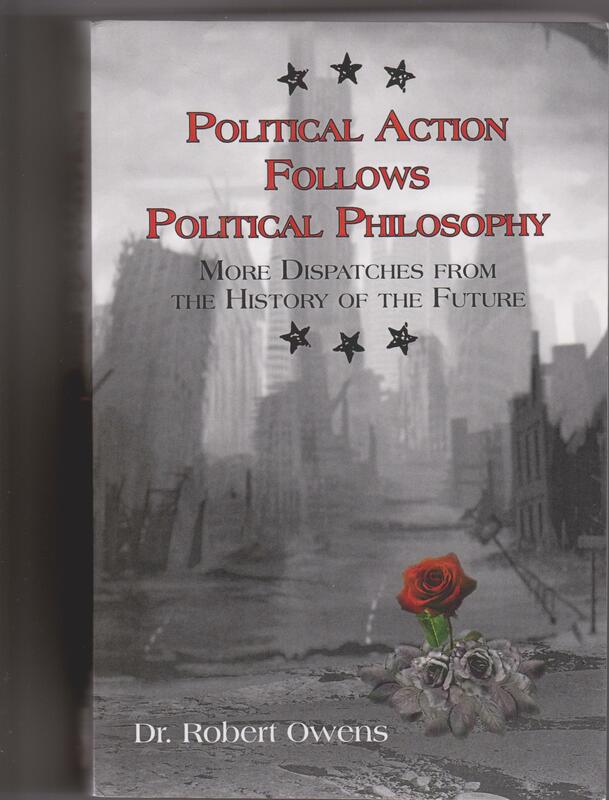 The Dispatches from the History of the Future contained in this book convey the basic political philosophy which I believe will one day re-inspire our nation to stride upon the stage of History with another round of liberating political action. Revolutions happened in other countries. That great slave house of nations the USSR, their satellite countries in Eastern Europe and Asia, African countries and of course those banana republics somewhere down south but one thing is for sure, it can’t happen here. Following in the footsteps of giants who have used these prophetic words of Sinclair Lewis I want to examine how it did happen here. In the America of George Washington, Thomas Jefferson, and James Madison, the America we inherited from our forefathers, we knew that there could never be a revolution. We had the Constitution with its checks and balances, its separation of powers, and its Bill of Rights. These were rock solid, carved in stone, and strong enough to preserve the Republic and safe guard the freedom of its people. Besides the American people would not stand for some wannabe dictator and his brown, black, or whatever color shirt followers marching through the streets and into the White House. The sons of the Pioneers wouldn’t sit still for any attempt to curtail limited government, personal freedom, or economic opportunity. No way! No how! Others might accept censorship, surveillance, and rigged elections but not us, not Americans. We had fought wars to defend our independence, wars to defeat totalitarianism; we had even fought wars to spread freedom. No, we wouldn’t quietly allow homegrown tyrants to grasp the levers of power. It sounds so comforting, “It can’t happen here.” If you take a beginning Political Science class in either High School or College you will learn how the government works. How bills become laws, how the legislature is made up of the freely elected representatives of the people, how the President runs the executive branch and the Supreme Court sits atop the judicial branch. You will learn about the Declaration of Independence and how the Constitution was written to replace the Articles of Confederation which were too weak to work. Yes, you will learn all about how it’s supposed to work. In most schools you will also learn that the Constitution is a “living Document” that can be re-interpreted to fit every generation and every age. The results of 100 years of re-interpretation have led us to the brink of ruin and me to recommend that the study of the Constitution should be moved from Political Science to History since what rules us today is legal precedent and bureaucratic regulation. The courts use foreign laws and traditions to interpret our laws and traditions. The legislature passes laws they don’t read filled with thousands of pages of vague platitudes and goals that the bureaucrats fill in with no oversight and the force of law. And the President does whatever he wants and no one says a thing. From here it was just a matter of time until a revolution was accomplished through evolutionary change. Once the centers of power were secure in Washington, Hollywood, and in the media the trickle of change became a torrent and the torrent became a tsunami. Two wings on the same bird of prey, perpetually re-elected representatives from the twin headed party of power pander to the lowest common denominators, buying votes, using taxes to punish enemies and tax money to reward friends. Our tyrants-in-training have captured the government and the economy, created a dependent class of motor-voters, convinced people that a continually growing debt is sustainable and turned the government into the one who picks winners and losers instead of a free economy. The slow slide down a slippery slope has accelerated into a precipitous procession over a predictable precipice. To those who have seen this coming it is like watching a slow motion train wreck. The coming destruction is not mitigated in the least by the decades or warning. Our prideful boast of it can’t happen here has become a heart wrenching analysis of how it did happen here. How did the Progressives capture our land and subvert our Republic? They did it gradually inch by inch, step by step. When they lost a round they held their gains and as soon as possible recovered their long march toward a fundamentally transformed nation. There are only two ways to have a successful peaceful revolution. One: the vast majority of the people must go on strike and refuse to operate as a society until the changes have been made. Or two: it must happen gradually line upon line verse upon verse always keeping the goal in sight and moving forward at every opportunity. In other words we must do to the new establishment what they did to the old: not overthrow it. Supplant it and replace it in the hearts and minds of the people. And don’t lose hope. God created us to be free and though tyrants always seek to ensnare people in their self-serving systems we will one day be free again. Draw near to God and He will draw near to you. Remember what we thought couldn’t happen here did, and what they think can’t happen to them will. Freedom will rise from the ashes, and one day the light of liberty will once again burn brightly in America the beautiful. There are some things that are more than uncomfortable, they are almost unbearable. When Glug the caveman dragged himself back to his little efficiency cave and tried to feed his wife and kids with the little rabbit he was able to kill and his neighbor Gork in his sprawling Mammoth Cave compound next door feasted his family and the local witch doctor on prime rib of mastodon you can bet Glug knew the difference even though he had never experienced the difference. However there is something even worse than being poor. That is being poor again. Another of those nearly unbearable things are people who lie to your face over and over and over and they continue to lie to your face even when they know you know they are lying? However there is something worse than this. That is being so pliable that you never call them on the lie. Maybe it is because you have never taken the time to investigate their statements enough to recognize a lie. Perhaps it is because you have heard the lie all your life and you have merely accepted it as fact. Or could it be because standing up and telling liars they are lying takes moral courage, internal fortitude and backbone. As Lenin, Adolf Hitler, his propaganda Minister Joseph Goebbels and many other totalitarians, utopians and other statists have often said, “A lie told often enough becomes the truth.” This is the operational dictum our Elites seem to be operating on. From every mouthpiece and source the lies are trumpeted over and over. From the classroom to the newsroom, from the debate to the campaign, from the courthouse to the capital over and over the party line goes forth. Every candidate and commentator whenever they refer to illegal immigration they base their profundities on the figure 11 million illegals. Whether they were for them or against them this was the figure everyone agreed on. Listen to the news. Read the newspapers. Tune in to the endless campaign commercials. Listen to a lecture in a public classroom and this is the number you will hear every day, all day, and at least twice on Sunday. It might be 11 million living in the shadows. It might be 11 million who need to be deported. It might be 11 million who are doing the jobs Americans won’t do. Whatever the context, it is always the same number. So no matter how the world seems to have changed around us the number leveled off at 11 million. War is peace. Freedom is slavery. Ignorance is strength. The interesting thing about that number is that it hasn’t changed since 2005 and even then so-called experts on counting the uncountable thought there could be as many as 20 million. Have people stopped coming? Does the immigration service run the country with the efficiency of security guards at an overcrowded Walmart; no one comes in unless someone else leaves? And this is not the only example. Think of the Vietnam War. It ended in 1973 with the Paris Peace Accords. Henry Kissinger won the Nobel peace Prize for negotiating this peace. In these accords North Vietnam acceded to our demands, they stopped fighting and returned the known and acknowledged POWS. In 1973 America won the Vietnam War: all combat troops left and for the United States the war was over. For two years the South Vietnam we had fought to protect stood as an independent nation. They held a democratic election, the opposition won, and there was a peaceful transfer of power. Then in 1975 after so many former anti-war and anti-government agitators had been elected what was then called the Watergate Congress made it abundantly clear that no matter what happened we would not support or even re-supply the South the North invaded. The dispirited southerners threw down their guns and surrendered. Every time the Vietnam War is mentioned in print, in class, on TV, or radio we are told it was a debacle, we lost, it was a mistake, and we are regaled with photos of people hanging from helicopters trying to escape the victorious communists or of bulldozers pushing planes off aircraft carriers. The problem with these pictures are that the people hanging from the helicopters were our South Vietnamese allies whom we had abandoned to the communists and the planes being pushed off the decks of our carriers were South Vietnamese jets and we were trying to make room for more to land who were fleeing the collapse we had caused. If we left in 1973 as victors of the Second Vietnam War and the Third Vietnam War ended in 1975 how do you lose a war if you aren’t there? Illegal Immigrants only take the jobs Americans won’t do. The national debt is sustainable. The Supreme Court issues settled law. Due to the restraint of time and space this list is not meant to be all inclusive. How long will we sit silent as we are fed these lies? What happens if we sit for too long? We eventually tune them out or we come to act as if what we are spoon fed is true. Either way the Elites win as We the People are forced to pay taxes to hire teachers to indoctrinate our own children in the lies. We all know that the truth is the truth and non-truth is the lie. Yet because of political correctness, peer pressure, and the uniformity of the media megaphone we know that some truths must never be said and some lies are repeated endlessly. When All in the Family made its big splash back in the 1970s I couldn’t see why it was supposed to be a comedy when it reflected the home I grew up in so closely. I looked for cameras outside our windows. Yet I bought into MLK’s vision of a color-blind America. I wanted and still want to see a land where people are judged by the content of their character instead of by any arbitrary circumstances, skin color, social class, nationality, or anything else. In the segregated South and the bigoted North of my youth I could see the injustice and I applauded the opportunity to strive for a society built upon the best and the brightest. After generations of trying to get there all I can ask is “Are we there yet?” And if the answer is no after the expenditure of trillions of dollars and after the imposition of quotas, set asides, busing, and other court mandated absurdities when are we going to be there? I say absurdities because the very idea that a government that seeks to end all discrimination based on skin color uses guidelines and policies based on skin color is patently absurd. Or at least it would have been considered so before we went through the looking glass from a constitutionally limited government of the people by the people and for the people to an all-powerful regime with an imperial president ruling by decree and a black robed priesthood able to make laws like the almighty writing on stone tablets. Looking at the current political environment in America as shaped by generations of revisionist History and perpetually repeating the Democrat Party line by the Corporations Once Known as the Mainstream Media anyone could easily believe the lie that the Democrat Party has always been the champion of Civil Rights fighting the good fight against the reactionary Republicans. Nothing could be further from the truth. Before the Civil War the Democrat Party was the party of slavery fighting tooth and nail to block any restriction on the spread of that foul institution. It was the Democrats who led the South out of the Union and who dominated the Confederacy the entire time it fought to preserve its peculiar institution. After four terrible years of war the Republicans imposed the ratification of the Civil War Amendments (13th, 14th & 15th) as a precondition for the defeated southern States to re-enter the Union as full members as opposed to conquered territories. The Civil War Amendments protected equality for emancipated slaves by banning slavery, defining citizenship, and ensuring voting rights. These federally imposed measures worked as long as the North kept an occupying army in the Southern States during Reconstruction. The freed slaves were able to vote and they responded by electing Republicans to power in the South. During this time the newly freed slaves made many advances in education and economics as well as in political liberty throughout the South. Gradually Southern states began electing members of the Democratic Party into office, ousting so-called carpetbagger governments and intimidating blacks from voting or attempting to hold public office. By 1876 the Republicans remained in power in only three Southern states. As part of the bargaining that resolved the disputed presidential elections that year in favor of Rutherford B. Hayes, the Republicans promised to end Radical Reconstruction, thereby leaving most of the South in the hands of the Democratic Party. In 1877 Hayes withdrew the remaining government troops, tacitly abandoning federal responsibility for enforcing blacks’ civil rights. The South was still a region devastated by war, burdened by debt caused by misgovernment, and demoralized by a decade of racial warfare. Unfortunately, the pendulum of national racial policy swung from one extreme to the other. Whereas formerly it had supported harsh penalties against Southern white leaders, it now tolerated new and humiliating kinds of discrimination against blacks. The last quarter of the 19th century saw a profusion of “Jim Crow” laws in Southern states that segregated public schools, forbade or limited black access to many public facilities, such as parks, restaurants and hotels, and denied most blacks the right to vote by imposing poll taxes and arbitrary literacy tests. It was the retreat of the Republicans from power in the South and the re-emergence of the Democrats that ushered in 100 years of system of racial segregation so harsh and brutal it could have served as the model for South Africa’s notorious apartheid society. So who was Jim Crow? Jim Crow was a derisive slang term for a black man. It came to mean any state law passed in the South that established different rules for blacks and whites. Jim Crow laws were based on the theory of white supremacy and were a reaction to Reconstruction. How did this start after Reconstruction ended? In 1890, in spite of its sixteen black members left over from the days of Republican rule, the Louisiana General Assembly now packed with Democrats passed a law to prevent black and white people from riding together on railroads. Plessy v. Ferguson, a case challenging the law, reached the U.S. Supreme Court in 1896. Upholding the law, the court said that public facilities for blacks and whites could be “separate but equal.” Soon, throughout the South, they had to be separate. Two years later, the Supreme Court seemed to seal the fate of black Americans when it upheld a Mississippi law designed to deny black men the vote. Given the green light, Southern states began to limit the voting right to those who owned property or could read well, to those whose grandfathers had been able to vote, to those with “good characters,” to those who paid poll taxes. In 1896, Louisiana had 130,334 registered black voters. Eight years later, only 1,342, 1 percent, could pass the state’s new rules. Jim Crow laws touched every part of life. In South Carolina, black and white textile workers could not work in the same room, enter through the same door, or gaze out of the same window. Many industries wouldn’t hire blacks, because many unions passed rules to exclude them. In Richmond, one could not live on a street unless most of the residents were people one could marry. One could not marry someone of a different race. By 1914, Texas had six entire towns where blacks could not live. Mobile passed a Jim Crow curfew: Blacks could not leave their homes after 10 p.m. Signs marked “Whites Only” or “Colored” hung over doors, ticket windows, and drinking fountains. Georgia had black parks and white parks. Oklahoma had black phone booths and white phone booths. This was the democrat imposed regime of Jim Crow. This was the law of the land in the Democrat controlled south. It was the Democrats who fought segregation: standing in school house doors, beating protestors, attacking people with dogs and water hoses. It was the democrats who shut down entire public school systems rather than integrate. One prominent Democrat, the governor of Alabama, George Wallace proclaimed, “segregation now, segregation tomorrow, segregation forever” aptly stating the position of the Democrat party. Then along came the Civil Rights Act of 1964. The law revolutionized a country where under Jim Crow laws blacks and whites could not eat together in public restaurants or stay at the same hotel. It outlawed discrimination in public places and facilities and banned discrimination based on race, gender, religion, or national origin by employers and government agencies. It also encouraged the desegregation of public schools. The act had the longest filibuster in U.S. Senate history, and after a bloody, long civil rights struggle, the Senate passed the act 73-27 in July 1964. Contrary to the indoctrinated reality most people parrot as their own opinion or knowledge more Republicans voted in favor of the Civil Rights Act than Democrats. Take for example Ohio’s Republican Rep. William McCulloch had a conservative track record because he opposed foreign and federal education aid and supported gun rights and school prayer. His district (the same one now represented by House Speaker John Boehner) had a small African-American population. So he had little to gain politically by supporting the Civil Rights Act. Yet he became a critical leader in getting the bill passed. His ancestors opposed slavery even before the Civil War, and he’d made a deal with Kennedy to see the bill through to passage. “The Constitution doesn’t say that whites alone shall have our most basic rights, but that we all shall have them,” McCulloch would say to fellow legislators. Later, he would play a key role in the 1965 Voting Rights Act and the 1968 Fair Housing Act and become part of the Kerner Commission, appointed by the Johnson administration to investigate the 1967 race riots. It was the Democrats that tried to filibuster the Civil Rights Act to death in the Senate. It was the Republicans who fought to make equality a reality. For further reading and an enlightening study of the Democratic Party’s buried past I would highly recommend Wrong on Race by Bruce Bartlett. I own a small farm, a berry patch to be exact, and for the particular type of berry that I grow it is much more profitable to market them as organic. I grow everything organically out of choice. However to market anything as organic the operation must be certified by the government. So of course I must spend hours filling out and filling out and filling out forms. Of course there are fees, filing fees, inspection fees and certification fees. Then there is the time spent with the inspector at the kitchen table talking, not long, only a few hours out of a busy day. If you add up the fees and add in a reasonable estimate of the time I ended up spending more to become certified than I made selling my “Organic” berries. I put the word organic in quotation marks not because they aren’t organic. I do it because there is no way the inspector could actually know whether they are or not. He didn’t test the soil. He didn’t test the plants. He didn’t test the berries. He went exclusively by what I told him, what I documented in my field logs, and in the forms I filed. We actually do grow everything organically, and as I said we do that because of our own desire to grow, eat, and market chemical free food not because the government tells us we have to do so. However, the process the government follows not only encourages fraud it makes it possible. Does it seem credible that every farmer everywhere at all times is honest? Does it seem credible that somewhere there may be a farmer who farms using every chemical available and then just lies about it? In the end “Organic” means all the proper forms have been filed, all the fees paid, and the farmer told the inspector what he needed to hear. Here we have one more victory for government regulations that cost the farmer (read consumer) time and money. When regulation becomes strangulation economies stumble over the government instituted by the social contract between those governed and those governing. When regulations carry the force of law, when they read like telephone books written in insurance language held upside down, when they multiply like mosquitoes in a swamp people begin to regard them and the governance they represent as a hindrance instead of a help. Have we reached the point where everyone is guilty and the government merely needs to decide when to pick us up? I guess it is lucky for the peace and tranquility of the present regime that the descendants of these Founders are too busy watching the game and throwing back a few cold ones to follow this final piece of advice for if any government has ever become destructive of these ends it is the Leviathan with which we are now confronted. The current crowd of the perpetually re-elected and their K-Street crony capitalist friends remind me more and more of King George every day. If you ever wonder about this just read the bill of particulars in the Declaration and substitute the Federal Government for He. If we are too comfortable or otherwise engaged to “institute new Government” might it be possible to at least return to the Constitutional limits upon the present one? If so how can we go about it? Should we pass a law that says, “The Federal Government must abide by the Constitution” and then wait for the Supreme Court to interpret that to mean “The Federal Government can do whatever it pleases”? That might not work out too well; however there is an idea whose time may have come. The REINS Act is designed to reign in government and at least provide some accountability. You see here is how the people’s elected representatives have stacked the deck so that they get the accolades and avoid the brickbats. First they pass a law which says something general that everyone can agree on such as, “Make the water or the air cleaner.” This law will just say that, make whatever it is better with no specifics. However the law will create and empower a bureaucracy such as the EPA to fill in the blanks and enforce the new blank filling regulations with the force of law. Then when these new regulations step on someone’s toes as they inevitably will and they complain to their representative the perpetually re-elected become incensed and rail against the unjustness of the regulation. Perhaps they will even march in protest in solidarity to the great unwashed against the arbitrary nature or silliness of the regulation. They will at the least offer to write a letter to the bureaucracy on behalf of the outraged citizen and thus they get the credit for wanting the cleaner whatever without the responsibility for imposing the statist regulations that make the cleaner whatever possible. So how do we wrest control of our lives back from the bureaucracy our elected officials have abdicated their authority to? We pass the REINS Act and reign them in. On July 28, 2015 by a vote of 243 to 165, the House passed H.R. 427, the Regulations From the Executive in Need of Scrutiny Act of 2015, known as the REINS Act. Introduced in the House by Rep. Todd Young (R-Ind. ), the bill “would require any executive branch rule or regulation with an annual economic impact of $100 million or more — designated by the White House’s Office of Management and Budget (OMB) as a ‘major rule’ — to come before Congress for an up-or-down vote before being enacted.” Sen. Rand Paul (R-Ky.) has introduced the companion legislation, S. 226, in the Senate. The Judiciary Committee’s report on the bill explains that back in 1996, the Congressional Review Act (CRA) was implemented as an attempt to get control over the large number of regulations coming from the federal government. But only one regulation has been undone using CRA, while 60,000 regulations have come into being. Major regulations accounted for 1,000 of them. These regulations are costly. According to The Economist, the Competitive Enterprise Institute reported that in 2013, the compliance cost of federal regulations was $1.86 billion, or $15 billion per household. The biggest problem with this approach is that the current resident of the White House will veto the law and it is doubtful if the Congress has enough people dedicated to putting the limit back in limited government to override an imperial president who rules by decree. And the beat goes on as We the People continue to get beat down by our own government.